Nuestra Señora del Carmen is one of the many titles or advocations of the Blessed Virgin Mary, mother of Christ. Under this title Mary is patron of the Carmelite Order named after the mount in Palestine where the first chapel dedicated to her was built. According to pious legend she appeared to St. Simon Stock of England in the 13th century and gave him the Carmelite Scapular with promises of special graces and protection to those who wore it faithfully. 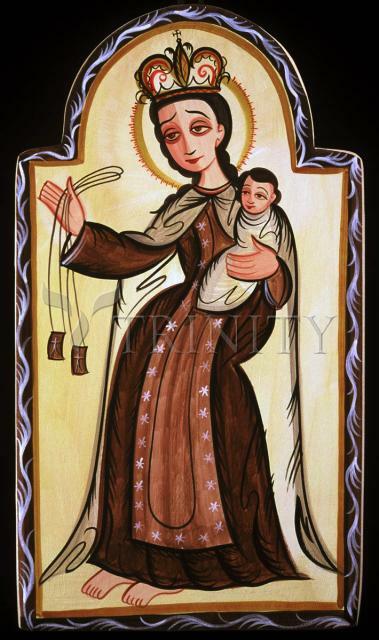 In sacred art Mary is shown wearing the brown and white habit of the Carmelite Order holding the Christ Child and extending the Carmelite Scapular to souls in Purgatory. In New Mexico Nuestra Señora del Carmen is appealed to for protection against all dangers, especially hell. She is patroness of souls in purgatory and members of the Carmelite Orders. A small village in northern New Mexico is named after Carmen. In 1785 Don Martin de Lecuna ordered an image of Our Lady of Carmel from a sculptor in Quito. The statue and the devotion to it have since been associated with the struggle of the Chilean people for independence. On 5 December 1811 General Jose Miguel Carrera and General Bernardo O'Higgins asked the Vicar of Santiago de Chile for a "Solemn Mass of Thanksgiving" for success in the struggle for independence. On 5 January 1817, General Jose de San Martin placed his baton in the right hand of the image, and named her patroness of the Army of the Andes. On the eve of the battle of Chabuco, General O'Higgins proclaimed the Virgin of Carmel patroness and general of the Chilean armed forces. In 1818, as Spanish forces advanced, the people and their leaders crowded into the cathedral to place their prayers and trust at Our Lady's feet, promising to raise a church in her honor at the site where Chile's independence is signed. By the end of the year construction had begun. The shrine was completed in 1892, and the present church in October 1974. In 1923, at the request of the Chilean bishops, the Vatican proclaimed the Virgin of Carmel principal patroness of all Chileans, not just the army and navy. There are two Carmel images that Chileans venerate, one at the National Shrine of Maipu, carved in Quito, Ecuador in 1785, the other made in France, and housed at the Basilica of the Savior in Santiago de Chile.